Pipe bursts can cause a lot of problems for your home. The pipes freeze overnight, and the resulting ice begins to place a lot of pressure on the inner lining of the pipe. In a short period of time, the pressure can cause the pipe to crack. Once the water thaws, it flows out of the pipe, flooding whatever area the pipe is located in. 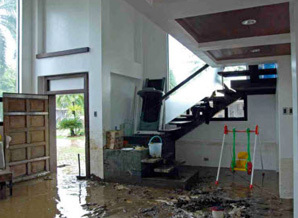 If a pipe in your home has burst, call Skyline DKI for fast recovery services. Our water damage restoration team will repair the pipe and take steps to prevent the damage from spreading. They’ll then work to clean up any standing water and to make sure that mold doesn’t begin to grow. In short, we’ll completely clean up the mess caused by the burst pipe. For water damage restoration services throughout Chicago and Milwaukee, call the burst pipe cleanup experts at Skyline DKI!